Have a look at these boards. Seemingly the same. But in fact they all feel very different on the water, thanks to different characteristics. For a student a punch is just a punch. As the student progresses she starts to analyse and pick apart the components that the punch consists of; movement, angles, forces, hit areas… The punch is no longer just a punch but rather a complex body of parts that need to work together. The student keeps practising and finally becomes a master, at which point a punch is again just a punch. It has become second nature where all parts are so tightly knit that there’s no room for error. This applies to any domain. 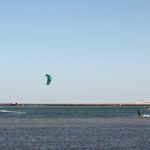 As a newcomer to the sport, fresh out from the three day starter course, kitesurfing is still daunting. 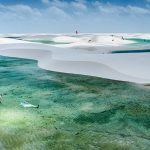 There is a lot of equipment, strong forces at play and a constant balance act of kite flying, board control and checking the surrounding just to pull off a water start. But heck, it’s a shedload of fun too, and that’s why we don’t give up right!? Part of getting started is getting your own gear — something I remember having a lot of fun with back in 2010. Admittedly I knew little about what gear was appropriate for a beginner and as a result graphics played a bigger role than performance in deciding gear. So with that in mind, I put together this list of board types as a guide to help you find a good fit for your needs. Maybe I do the same with kites in the future. Let me know what you think. Let’s get the directional boards out of the way first. Probably not your first purchase but good to be aware of. You like waves, you hang loose, you surf. Kite surf. Big fuckers. Almost small boats. They go upwind really easily and go fast. Foilboarding is quickly becoming the new standard for racing because these funky looking boards are super fast on the water thanks to the lack of friction from the board. That also means they’re ideal light-wind boards. High learning curve though. Yeah baby, right foot forward, left foot forward it’s all the same on a twin-tip. 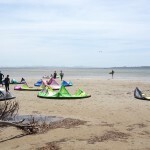 The biggest category of kite boards. Freeride means to cruise around, do a bit of hooked-in jumping and ride various conditions. An all-rounder in other words. Boards that are more trick-oriented and optimised for unhooking. This means stiff boards with a bit more rocker for better pop and softer landings. These boards still work well as freeride boards. One might loose a bit of upwind ability but gain a more responsive and fun board. These boards are going one step further towards unhooked trick orientation. 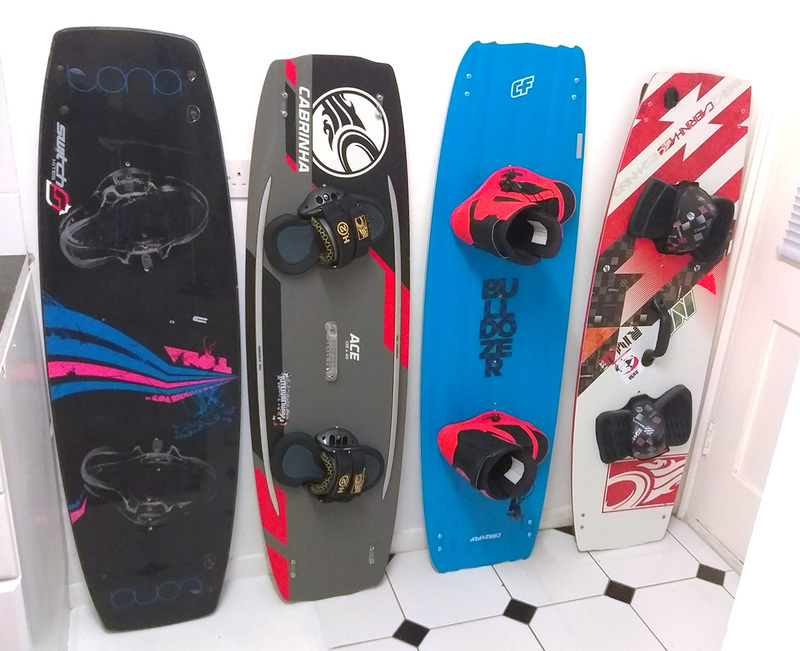 They are hybrids that work well after a cable or boat while not as slow as a pure wakeboard. They are usually ridden with boots, have a enforced base for hitting sliders and other things and can be ridden finless for the same reason. They have big rocker which slows them down. Big boards made for light-wind days, although not as light as can be ridden with a foil board. The float is affected more by width than length and boards in this category would be at least 43cm wide. A fairly new category of boards let you dissemble the board in two halves so it fits in a suitcase. Great for traveling and they still perform well as freeride boards. Apart from coming in pink the boards for women are smaller and have flex patterns well suited for women, as well as smaller straps and pads. This will affect carving, upwind ability, pop, spray… a lot! Get a board suitable to your weight and height. Big boards provide more float for heavy riders, but they become harder to maneuver. If you’re tall a short board might not give you a stance wide enough for good stability and edging. The rocker is the curve from tip to tip. More rocker equals more curve and this makes for better carving, more pop and softer landings, but it slows the board down so more wind strength is needed to go upwind. How soft or hard the board is. A flex pattern can be complex but most commonly it’s stiff between the feet and softer in the tips. Stiff boards provide better pop and stability but makes for a hard and bumpy ride. Both are there to provide grip so the board can go upwind more easily. It also provides stability. Channels can affect the speed and softness in landings but are only really needed if you ride finless, and a lot of channels in today’s boards are too small to provide anything but a cool look. What kiteboard should I get as a beginner? Try a few boards and see what you like. Usually beginners are advised to get a slightly bigger and softer board so they can easily water start and stay upwind. Don’t do the mistake of buying a board too small or targeted for wake-style as this will make the learning curve a lot steeper. I’ve written on this topic before after moving to boots myself. I love riding boots but for a beginner there is no need really. They take up more space, cost more and are harder to get in and out of, but if you’re comfortable with being locked into your board they provide superb stability. A handle is really useful for carrying your board and using to easier get into the foot straps. But originally they were there for board-off tricks and this is still the main purpose although it looks better to grab the rail. Lots to learn eh? Just give it some time, have fun with it, try your friends’ boards and you’ll see how small differences can make a big difference on the water.